All our professionals at Advanced Family Dental maintain the highest levels of accreditation and pursue ongoing education to stay abreast of the latest trends in dentistry. Dr. Le came to America from Vietnam when he was 15 in search for freedom and better educational opportunity. He worked the night shift at a supermarket to support himself through school. 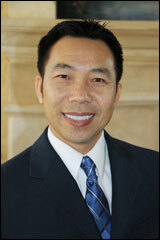 He completed his dental training in 1994 at University of Missouri, Kansas City. Dr. Le feels fortunate to find a career in dentistry which allows him to combine his clinical and artistic skills to make beautiful smiles. Dr. Le believes in treating patients as family members; therefore, he always uses warm and caring approach to make them feel comfortable at his office. He takes advantage of advanced technology to provide safe and effective treatments for his patients. He feels such privilege that patients have chosen him for their dental needs. Dr. Le is happily married with two beautiful daughters. In his spare time, he enjoys cooking for his family and friends, exercising, and traveling. He is passionate about giving to charitable organizations.